Potato vine (Solanum laxum): growing, planting, caring. A climber with evergreen foliage that may bloom all year long. 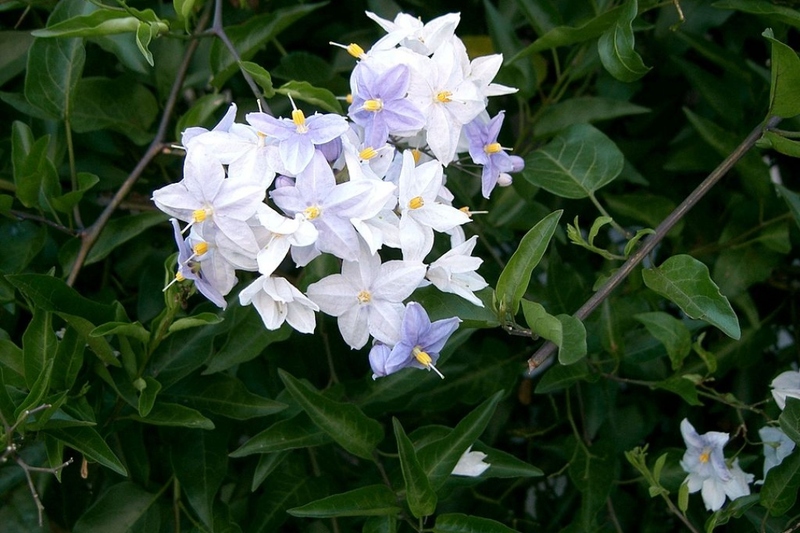 Solanum laxum -the potato vine - is a species in the family Solanaceae, native to South America and commonly grown as an ornamental garden plant. It is a vigorous evergreen vine - actually an aggressive grower, easily growing to 10 meters! - with ovate-lanceolate leaves 50 mm long, and white or pale blue flowers appearing in branched inflorescences. In open soil or in pot? It's simple, if at home the temperature drops permanently below 5 ° C, it will be in pot! Do not leave your plant in the original pot but repot it in a slightly larger pot - terracotta! Plant in the spring in a sheltered and sunny place. It calls for a rich and well-drained soil because it dreads when its roots stagnate in the water. In the open soil, choose a slightly sunny location, even in the semi shade. Water copiously to facilitate rooting. Your potato vine is non-hardy - it will not survive a frost episode! If your plant is outside and you fear a very cold period, add a thick layer of mulch at the foot ,and protect it with some insulation material if you can.